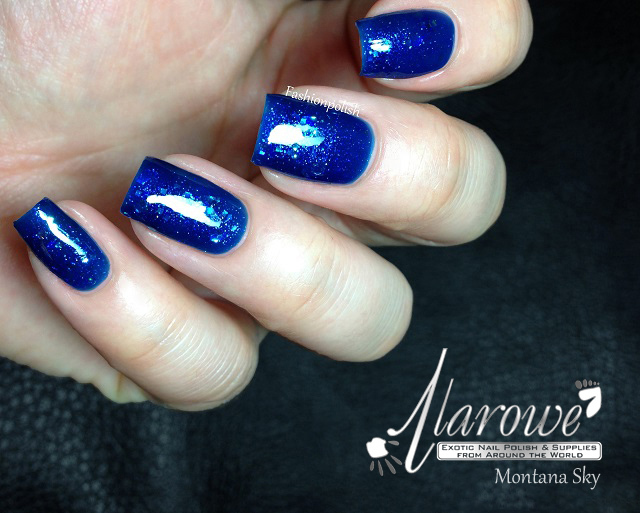 Fashion Polish: Two weeks of Colors by llarowe : Montana Sky! Two weeks of Colors by llarowe : Montana Sky! The series's almost over, today's post of "Two weeks of Colors by llarowe" is the one before last! Montana Sky is a deep shapphire blue jelly packed with iridescent glitters mixed with blue shimmer. It's absolutely gorgeous, although I might be biased given my love for blues haha. Formula was even and so was glitter dispersion on the nails but it was really sheer. I applied three thin coats plus topcoat and I could still see a slight VNL under certain lightings.